Welcome to the world’s No1 award winning, official free television and radio ticket destination. We are the only official and authorised ticket unit to handle our shows. Our free tickets are not available on any other website or through any other company. 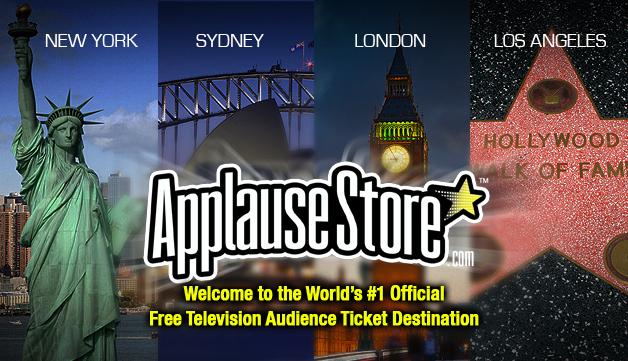 ApplauseStore™ is the award winning, one-stop-shop for free, official television and radio audience tickets for thousands of the very best music, comedy, chat, sitcom and entertainment shows produced at many different studios and locations all around the world. Since early 2001, our professional, friendly team of top Audience Researchers have been inviting people to become a member of a studio audience and witness first-hand what really does go on 'behind the scenes', see how a production is put together and see their favourite celebrities and stars in person! Depending on Broadcasters schedules, we officially and exclusively represent television's hottest shows produced for most of the major channels including Nine, Yahoo7!, Ten, Fox, CBS, BBC, ITV, Channel 4, E4, Channel 5, Sky1, MTV and all Satellite & Cable channels. Plus, at certain times throughout the year, we distribute free tickets for pilots, specials, award shows and other one-time-only television events! We also represent television shows and productions for other top Broadcasters worldwide via our international ticket offices in Los Angeles, New York, Sydney and New Zealand, with South Africa and Canada coming soon. If you are in an club, association, organisation or simply have a large group friends who would like to come and be part of a show, then our Group Bookings Department specially arranges reservations for groups of 11 or more. Attending the filming of a TV show is a great activity and as all the tickets are free, there is NO cost to you. To order tickets simply email us on groupbookings@applausestore.com. We really hope that you enjoy our award winning service and look forward to seeing you down at a studio very soon! Thank you for taking the time to visit our website. We really appreciate your interest in Applause Store.com.